Some researchers are now testing to see if phage therapy could be a possible treatment for some conditions, such as chronic sinusitis and wound infections. Phage therapy, which uses bacteriophages, was neglected for decades (except for Russia and the Republic of Georgia), but their use is again being studied as an alternative to antibiotics. A bacteriophage is a virus that lives within a bacterium, replicating itself, and eventually destroys the bacteria. The term is from "bacteria" and the Greek "phagein" which means to devour, so think of them as "bacteria eaters". Phages only attack specific types of bacteria (they are "bacterium specific"), so they’re unlikely to harm the normal microbiome (community of microbes) or any human cells. I've been posting about the beneficial bacteria Lactobacillus sakei that treats chronic sinusitis, as well as some other probiotic (beneficial) bacteria that people have reported success with (see The One Probiotic That Treats Sinusitis). Most people contacting me or commenting have reported success with L. sakei products, but there is a group for whom L. sakei and other probiotics haven't helped. Why? And what can be done? Perhaps their sinuses are missing still unknown "keystone" species (very important microbial species for health). Or perhaps they have bacterial biofilms that even Lactobacillus species that are viewed as anti-biofilm cannot overcome. Perhaps phage therapy might help these people? Phage therapy is currently being tested by researchers in the treatment of chronic sinusitis in Australia. The video Antibiotic Resistance discusses phage therapy for sinusitis starting at 23:30. Looks promising. An arcane therapy for bacterial infections that dwelled behind the Iron Curtain for decades is making a comeback in Western medicine as a potential white knight against superbugs. Phage therapy involves infecting patients with viruses known as bacteriophages, which are the natural predators of bacteria, to kill the germs that antibiotics cannot. Scientists hope these harmless viruses will cure patients who have been infected by bacteria that is resistant to antibiotics, causing chronic ear, nose and throat infections as well as life-threatening illnesses such as sepsis. The first human trial of a phage therapy began at the Queen Elizabeth Hospital in Adelaide last week, when a female patient with chronic sinusitis started using a nasal rinse swimming with phages that target golden staph. These days, centers like the Eliava Institute of Bacteriophages, Microbiology and Virology in the Republic of Georgia offer commercial phage preparations for specific indications, such as MRSA and gastrointestinal infections caused by E. coli and Shigella species. 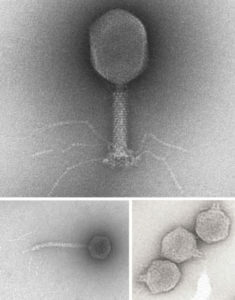 Researchers at the Eliava Institute also mix phages into custom cocktails for many infections. ...Years of research at the Eliava Institute have led to a carefully curated library with hundreds of vials of such isolates, from which the scientists prepare their custom combination therapies. But many questions remain....Another open question is how therapeutic viruses interact with the human immune system, and whether they might cause side effects. At the Ludwik Hirszfeld Institute of Immunology and Experimental Therapy at the Polish Academy of Sciences—where patients receive phage therapy on compassionate-use grounds after they’ve failed to respond to other treatments—researcher Andrzej Górski is sifting through years of clinical data to find answers. In a retrospective analysis of immune responses in 153 people treated with phages between 2008 and 2010, Górski and his colleagues reported that the therapies were well-tolerated in 80 percent of patients.10 Only a small number had to stop treatment because they experienced adverse reactions such as nausea or pain in response to gut treatments, or local reactions to topical phage applications, Górski said at a first-of-its-kind NIAID workshop on phage therapies that convened in Rockville, Maryland, last July. Despite the challenges still facing phage therapy, numerous companies are now looking to bring the treatments to mainstream clinics.....A handful of US companies also aim to bring phage preparations to clinical trials. In 2009, the Maryland-based firm Intralytix published the results of its Phase 1 trial for a phage therapy that targets venous leg ulcers in diabetic patients. None of the 40 or so patients who received the phage cocktail had any adverse reactions to the treatment, but the company has not said whether a Phase 2 trial is planned.13 Meanwhile, Richmond, Virginia–based AmpliPhi Biosciences announced in November it was enrolling nine patients to test the safety of a natural phage cocktail intended to treat chronic sinus infections caused by S. aureus. There is increasing evidence to suggest that the sinus microbiome plays a role in the pathogenesis of chronic rhinosinusitis (CRS). However, the concentration of these microorganisms within the sinuses is still unknown. We show that flow cytometry can be used to enumerate bacteria and virus-like particles (VLPs) in sinus flush samples of CRS patients....We found high concentrations of bacteria and VLPs in these samples.....Our finding, that large numbers of VLP are frequently present in sinuses, indicates that phage therapy may represent a minimally disruptive intervention towards the nasal microbiome. An alternative treatment is phage therapy which utilises specific bacteriophages (phage) that infect and kill pathogenic bacteria ....Our results showed that the sinus, at least in patients requiring sinus surgery, is an active microbiological environment. We speculate that most VLPs detected are likely to be bacteriophages as they are the most commonly found in association with their hosts, bacteria, which we find to be present in abundance in sinuses. The proposal that phages can be used to treat bacterial infections of the sinus  can now be viewed in the light of this data showing that phages appear to be present in sinuses in large numbers.